Composiflex uses “Hand Lay Up” for two main processes: Pre-Preg/Autoclave and Wet Lay Up. The term “Lay Up” also refers to the combination of materials that are inserted into molds for Resin Infusion and Resin Transfer Molding. “Lay Ups” are engineer-specified layers of advanced composite materials. 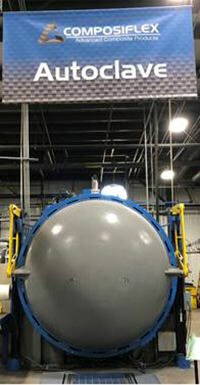 Pre-Preg composites (woven cloth or uni-directional fibers with pre-impregnated resin), core materials, and other materials are combined in a Lay Up that is processed in a mold and typically a vacuum bag in the autoclave process. See the Autoclave Process details for more information on this process. For less demanding applications, an oven can be used instead of an autoclave. Wet Lay Up composite applications include cowlings, covers, some aircraft components, and prototypes of several types of applications. Wet Lay Up can be used to manufacture large structures.